The Stockholm Bar Stool Beige is the perfect way to introduce simple elements of Scandinavian style into your home. Simple and stylish, the Stockholm is bang on trend. A cool combination of new and old materials, the Stockholm will add originality to the bar area. Upholstered in neutral beige fabric, the square seat pad is filled with high-density foam for a cushioned feel. And, its backless design tucks neatly under kitchen worktops and bars. Fixed at kitchen counter height, the frame is formed of four elegant bentwood legs, finished in a rich walnut tone. 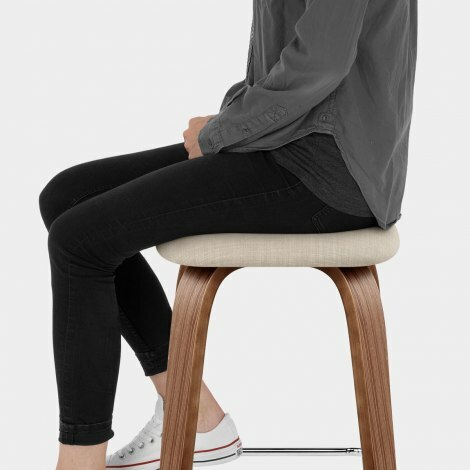 A square bracing bar adjoins the legs, enhancing the stability of the stool while acting as a handy rest for your feet. Protective floor plugs are also included, cleverly designed to aid in avoiding damage to your floors. 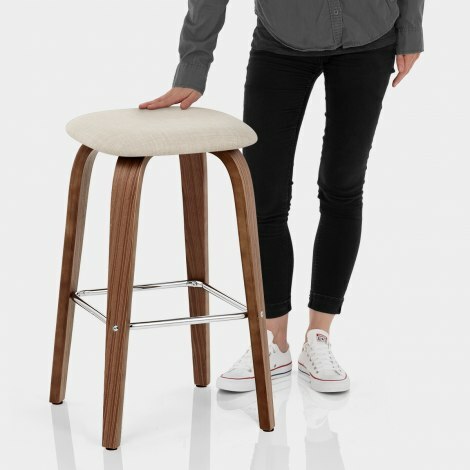 "I love this bar stool, perfect height and look"
Look great, comfy, easy to put together. Perfect for our kitchen island. Love these stools, great value for money and look fabulous in my new kitchen, would definitely recommend. Great next day delivery and good quality stoo. Looks very stylish in new kitchen - well pleased. I love this bar stool, perfect height and look for our breakfast bar. Looks as good in person as it does online!! Great value, super stylish. Perfect.